Every morning you style your hair and get ready for the day ahead. But what if you could make a few minor modifications to your styling routine and encourage increased hair growth all day, everyday? By increasing the nourishment provided to your hair, it will become shinier, thicker and faster growing. With these three easy tips, you can nourish your hair while you work, helping make it healthier, thicker and more beautiful. 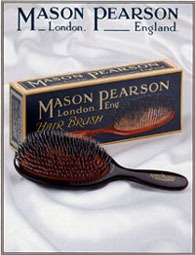 Mason Pearson’s original 1885 handmade Boar Brush design. First off, never brush your hair while it’s wet. Studies have shown that wet hair loses more protein when brushed than dry hair. “Protein loss” means little bits of hair are broken off when you brush. Eventually this causes split ends. Make sure your hair is completely dry before brushing to prevent protein loss and split ends. Use a wide bristled hair brush for de-tangling but consider using a hard bristled boar brush to brush your scalp. This will stimulate blood flow to the follicles, helping to nourish the hair follicles. The boar brush will also help exfoliate your scalp, keeping pores clear. Try giving your scalp a brush with a boar brush whenever you get a chance, to increase blood flow to your hair follicles throughout the day. If you have dry hair, try massaging a small amount of organic extra virgin coconut oil into your hair. The coconut oil will protect the hair shafts from protein loss throughout the day, preventing split ends. For a little extra benefit, try using one of these products that prevent split ends and protect the hair before styling your hair in the morning. Products like these contain nutrients that absorb through the scalp, feeding the hair throughout the day. When choosing styling products, look for the ones with natural, nutritious ingredients. Rather than applying synthetic chemicals to your hair, that won’t benefit your hair or scalp, you could be feeding your hair with natural fruits, vegetables and herbs. Ever heard of traction alopecia? Nor had Naomi Campbell until it was too late. Traction alopecia is a type of hair loss caused by regularly wearing hair in a tight hairstyle that pulls at the roots. Weaves, tight ponytails and braids ‘train’ the hair roots to grow closer and closer to the scalps surface until eventually the hairs no longer have an anchor in the scalp and they stop growing altogether. Don’t pull your hair into tight styles that pull the hairs from the scalp. At night when you sleep push your hair up above your head, preventing the hair from being pulled on while you sleep. Choose silk pillow cases if you can – the reduced friction will help prevent any traction alopecia. There are several key ways of improving the health of your hair. Start by protecting the hair you already have from breakage. By preventing split ends your hair will look healthier and it will grow longer. In addition to protecting, you need to feed your hair. Hair is made of keratin, which is made from amino acids. It receives those amino acids via the bloodstream. Using the boar brush to stimulate blood flow to the hair follicles will help increase the nutrient supply. By consuming a diet rich in proteins you will increase the raw materials needed for hair growth. By consuming lots of greens, you supply your body with the supporting nutrients, such as B vitamins, needed to promote hair growth. If you want to improve the health of your hair, think: protection and nutrition. How Katie Piper REALLY feels about airbrushing and Instagram filters - HELLO!